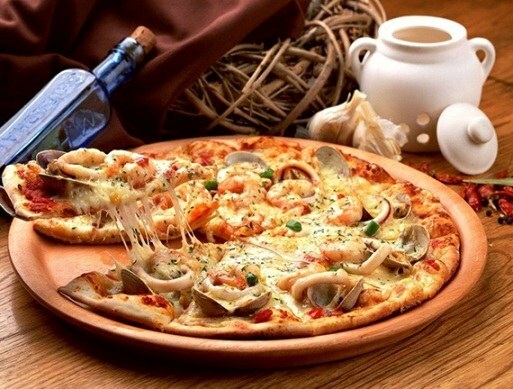 Pizza is one of the most popular dishes of Italian cuisine. It is also widely known outside of Italy, thanks to the good taste and great variety of toppings. Often, however, home cooks are reluctant to undertake this dish, because it scares them pretty long and laborious process of making the special dough consistency. If you modify a recipe, you can quickly and easily cook pizza from the batter. - a little 9%-nogo vinegar for damping soda. If you want to make the dough tastier and more aromatic, can when mixing add a little more garlic powder or chopped aromatic herbs. Yogurt can be replaced by approximately the same amount of low fat sour cream. To make the dough for this recipe, take a deep container (bowl, pot), sift into it the flour. Then slowly pour in the yogurt or sour cream, the contents of 2 eggs and mix thoroughly until a homogeneous mass (for this you can use a mixer). Then add salt, sugar, baking soda, quenched with vinegar and again mix thoroughly the ingredients. Liquid pizza dough ready. Mix in a deep casserole mayonnaise and sour cream, crack in the egg, thoroughly mix the ingredients until a homogeneous mixture. Then, gradually adding flour, knead the dough. Preparation of the batter for the yeast-based will take more time. But in any case it will be faster and easier than cooking a classic yeast dough for pizza. - 2 tablespoons of vegetable oil. It is better to use olive oil, but you can replace refined sunflower or corn. Dissolve dry yeast in warm water, add salt to taste, vegetable oil. Little prisypaya flour, knead the dough by hand or with a mixer. For consistency it should be like pancakes. If it is very liquid, add more flour. Place the container with the dough in a warm place for about two hours. You can then cook the pizza.